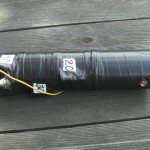 20 cm long PVC pipe with a diameter of 50 mm. An electrical cable of softer type 0.75 mm ² 3.67 m plus an inch for fastening and top eyelet. 30m coil about 8 turns. 40m coil is about 13 turns. 1 x BNC chassis connector. Use what you have. 23 cm 0.75 mm ² insulated for auto electrical cable. For connecting the right coil yuo want to use. 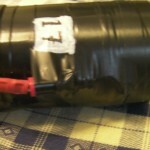 A roll of electrical tape of the required color. In the upper part of the plastic pipe, I drilled two opposing 3 mm holes, one for the radiator cable. Then I prepared a short coax with BNC connector on one end and open at the other end with a round pin on the center conductor. It sit at a round socket on the lower end of the radiator and connect the koax and ground of the correct length. Now, I can tune the radiator to best SWR on the desired part of 17 m ie QRP CW portion. Then I wrap the copper wire 4 turns and tape it temporarily. Now I connect this point to the koaxial and agree, here you can get to make some adjustments. When tuning is complete, I mount on a round connector (do NOT cut the copper wire) just bend it double and fix it well to the plastic tube. (Just bend the wire double so it goes in and out from the connector). To continue with the rest of the coils until it is ready .. do you want to have 80m so then a longer tube and try eg 25 to 30 turns of copper wire. Thereafter customary intuning. There should now be a socket at the base of the radiator which is the start of 20 m coil, then a socket at the end of the 20 m coil and so even at the end of the other coils. 40m coil ends at the BNC connector, even here, a socket sit (end of 40 m coil). Once everything is measured and clearly I fixed all contacts with the usual hot melt adhesive and covered with black electrical tape of good quality. A short cable of 23 cm with round pins are manufactured as the coupling between the different bands. Start from the socket for 40m to the BNC connector and connect the jumper to the socket / coil to run with. At each coil being measured is right ground plane mounted, I had only two wires of each band, it was good to get the SWR down between 1-1.1 and 1-1.5 ~. 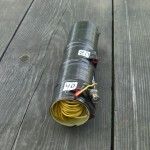 I use a 6 m of fiberglass fishing rod as a carrier, you can also hoist this antenna in a high point (5-6 m). The radiator I mounted to a nylon cord at one meter to the coil would not be too high up, so it should of course go great with a 5 meter rod and skip the nylon cord. The spool should hang at least one meter above the ground, preferably 1.5 meters. One of the 3 mm holes in the top of the plastic tube, you can conveniently extend to eg 10 mm to easily get there hoist rope if needed. 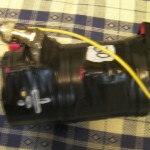 A little extra thing I did was to mount a strong elastic strap (black) across the tube inside. Then is not the tube rattling, and may reduce the peak load in very well with this relief. 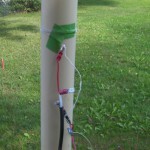 When tested by the entire assembly was all values ​​intact, I tried all ties with the ground plane for 30m and it worked. So all the lines can be stored inside the tube. This antenna is certainly to do with the other dimensions, then you get the other yards values of the coils, you can also use thicker or thinner copper wire, although it affects coil values. It’s just to experiment on a sunny day, you should probably be out, there are not as many as have access to a hall with ceiling height of 7 m.
As usual, click on the image so it becomes bigger. Top section of coil, here is connection for 17m. to the right of bnc is ground connection. 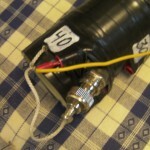 The bottom of the coil, here is the bnc and to the left link wire for the bands. Here is the hole for the hoist line to right. If you don´t want to use the radiator as hoistline.